Cloud-based interview marketing company Micronotes has locked in $3 million in funding today, bringing the company’s total amount raised to $8 million. The round was led by TTV Capital, a VC firm focused on early-stage fintech companies. Vestigo Ventures, also an early-stage VC firm with a fintech focus, participated as well. Micronotes will use the funds to scale its platform by bolstering the support of sales, marketing, and engineering. The Massachusetts-based company focuses on helping banks strengthen customer relationships with a platform-as-a-service (PaaS) that leverages machine learning to match customers with banking products and services. The company offers three main products. The first is Cross-Sell, which helps banks cross-sell products by conducting a mini-interview with customers about their needs without disrupting core banking functions. NPS Module enables banks to individually measure the net promoter score for a large percentage of its user base, instead of just a small sample. And the Predict Module, which scores how relevant every bank product is to each customer, and help banks to anticipate their needs. Micronotes was founded in 2008 by serial entrepreneurs and MIT Sloan School alumni, Devon Kinkead and Christian Klacko. Ian Sheridan, co-founder and managing director of Vestigo Ventures, and a member of the Board of Directors for Micronotes, said that the two “represent the rare combination of deep expertise in AI with the ability to achieve superior business outcomes.” At FinovateSpring 2013, the company demoed how Alliance Federal Credit Union leverages its cross-sell capabilities. Last fall, Micronotes released free downloadable propensity scores to help banks access predictive marketing analytics on their clients. TIBCO introduces integration-software solution, Project Flogo and translytical database for big data, TIBCO Graph Database. InFakt accounting system integrates with Valuto open API. 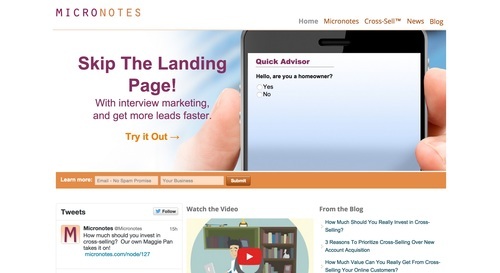 Micronotes launches downloadable trial version of Micronotes Cross-Sell Basic. eToro appoints Robert Brown as new non-executive director in the U.K.
Socure expands coverage for global watchlist filtering and sanctions compliance. Philippine-based credit union groups to build payments and banking platform based on technology from Temenos. Robotic automation technology from NICE Systems helps prevent credit card fraud at Italian bank, Banca Popolare di Sondrio. Finovate newcomer Student Loan Genius adds Honest Dollar co-founder Henry Yoshida as vice president of partnerships and product strategy. Cross-selling is an effective tool in financial services, helping banks market everything from mortgages to new savings accounts. Micronotes‘ Cross-Sell helps banks take the sales conversation from the branch to the online channel. According to an SEC filing, this week, the Massachusetts-based company announced it pulled in $910,000 in funding, bringing its total to $4.8 million. It plans to use the funding to drive the business to profitability. Micronotes’ Cross-Sell technology enables consumers to lead themselves through the sales process by answering questions about their status and interests. Aside from helping banks generate leads and learn more about customers, it also offers the opportunity to educate customers about products and services. Micronotes demonstrated its Cross-Sell platform at FinovateSpring 2013.